Where Is 2019 Taking Us? We all know that the world of digital marketing is pretty fluid. It has been so far marked with an array of advance development and is still evolving. Internet has made digital marketing the most sought after advertising property in recent times. Adding to its growth is the rapid adoption of smartphones. These modern gadgets have become the greatest tool on earth for accessing information. Today young generation is constantly hooked on to the virtual world through smartphones. The growing popularity of smart phone technology among millennial has made digital marketing more important than ever before for higher education institutions. Although, several universities and institutions are already engaging with students and prospective applicants online but quite a few are still struggling to create their own success stories using digital marketing strategies. While such educational institutions understand the critical importance of digital marketing techniques, there’s still lack of clarity about which digital marketing strategies are likely to offer them the best results. In 2019, technology will continue to evolve unprecedentedly. At the same time, Education sector in India is lagging behind in terms of technology adoption. If we expect our Education system to bring a qualitative change in the country then it has to break the barriers in technology adoption. Universities have to market themselves differently in 2019 than they did in the past due to the ever-changing nature of modern technology and growing competition in the sector. In this context, we have compiled some of the key trends in social media marketing and education technologies that will drive new waves for this year. These ten innovative marketing strategies for higher educational institutions will not only help in increasing brand outreach but will also bolster admission enrolments in 2019. Popular voice assistants such as Amazon Echo and Google Home have revolutionized the way people search for information. With their ever increasing popularity, it is likely that more and more businesses will use its services to reach out to their target audience. As a matter of fact, new voice assistants may be developed in 2019 with some more advance features. But how does voice assistants affect Universities and Colleges. Because, growing popularity of voice assistants will compel universities to pay even more attention to their website’s search rankings in order to implement this innovative and effective form of marketing strategy since voice assistants only recount information from the first search result. Therefore, universities have to ensure that their website ranks exceptionally well on search engines in order to benefit from this technology. Lead nurturing through email campaigns is already taking new dimensions in marketing. It has revolutionized the concept of drip marketing. As a result of email marketing’s growing importance in marketing communication, 2019 will witness numerous universities using emailers to support drip marketing strategy for lead enhancement. Email marketing allows plethora of engagement opportunities to institutions. Universities can create several talking points to connect to their subscribers using email campaigns. Alumni network has always been the most trusted source of information for admission seekers. Alumni of many colleges have carved a niche for themselves in the industry and place their alma mater in high regards. Endorsements by these alumni is often viewed as a crucial piece of trusted information by general public especially prospective students and their parents. Colleges often highlight achievements of their famous alumni. With colleges getting more aggressive on digital media this is likely to be an important strategy in 2019. Blogs bring lot of referral traffic on to your website. Hence, Universities and colleges have realized that these are a powerful advertising tool and therefore shouldn’t be missed. There are many ways in which universities can market themselves on blogs. In 2019, educational institutions can create a series of guest posts in which they can request high profile visitors in campus to share their expertise and views on a given subject in the form of blog content. This can also include video content. From SEO point, backlinks can be included in guest blogs to drive traffic to the university’s website. This will not only create an intellectual niche for your university in a certain domain but will also help in improving the website’s search rankings. PR exercise is one of the most effective ways to increase traffic to a University’s website. Online reputation management has become critical factor for assessing your institutions net promoter score. The current year has just taken off. In the days ahead, Universities can use third party articles for their online submission in building brand equity. Managing online PR activities effectively will ensure credibility of your academic brand and will help in generating more traffic for your website. The evolution of marketing automation has transformed the way crucial marketing processes such as CRM (Customer Relationship Management) and lead management are done. It has streamlined engagement with prospective students in a big way. 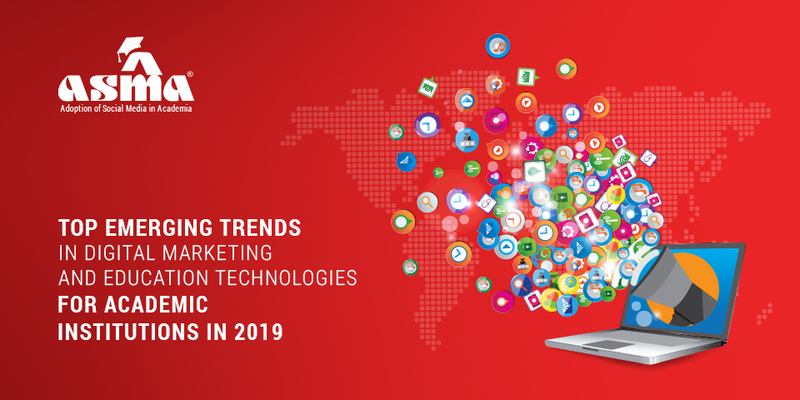 2019 will bring further evolution in automation of key marketing strategies to further entice and engage prospects on digital channels. Marketing experts feel that there is a growing need for generating personalized experiences which could otherwise result in loyalty switch over to other college brands. With growing influence of marketing automation platforms, 2019 will see increased efforts to design personalized communications based on audience demography. Efforts are already on by edu-tech companies to take marketing automation to the next level in 2019. They have started building work processes for enhancing effectiveness of marketing inventories to generate conversions and yield better ROI. If you want to create a difference, it’s important to leverage the power of Influencer Marketing in academic marketing. Take out sometime this year to identify such students who have a lot of followers and are really very active online. Reach out to them and ask if they’d be willing to share their thoughts on your institution’s social media pages. Think about live streaming their day at campus on your Facebook page. Allow the students to share their happy moments in college to build positive touchpoints around your brand. Word-of-mouth recommendations are becoming increasingly important in the digital world. Prospective students trust online peer reviews more than anything else. If taken strategically, 2019 can be the year of influencer marketing. University brands will look for influencers in large numbers to help build trust in their academic services to engage audiences. Influencer marketing is going to continue to be a driving force for academic brands looking to grow their audience and improve admission recruitments through social media in 2019. It is also a smart way to get prospective students to engage with fellow students who already know in and out of the college. Having strong content on your social media sites might not be enough this year. In order to ensure high outreach, higher education institutions need to invest more in paid social media campaigns. This is not to discount the fact that when it comes to community engagement, relevant content will still be important. Great online content has been really effective in generating conversions for admissions. Live streaming will continue to be a very popular tool of engagement in 2019. Online research indicate that a fast-growing number of people especially students prefer watching live streams over reading a social media post. Live streaming visually allows prospective students to get a first hand feel of your academic brand. Number of internet users is increasing rapidly with increase in smartphone. It has provided good opportunity to deliver education services online. With increasing interest from working professionals to acquire new knowledge and certifications, online education business will grow in 2019. More number of educational entities will join the online education market in 2019. Online education is useful to reach out to students beyond classroom learning. With increasing internet penetration in rural areas of the country, digital courses will help in qualification upgradation of rural youth. It will ultimately improve their employability factor. With advancement in internet usage and growing popularity of smartphones, digital marketing has become a buzzword of innovative marketing techniques used by higher educational institutions. Social media has changed the way advertising was done before. It is soon replacing traditional mediums of promotion. This means that a strategic shift in your marketing budget is likely to play a key role in the success of digital marketing initiatives in 2019. A great advantage of digital marketing is its ability to connect through different mediums, and allow for personalization of content. Hence, it’s easier to engage with students directly with using digital media tools.